Chinese style fried vegetarian bee hoon with mixed vegetables and shitake mushrooms. This dish is suitable for vegetarians, personal diet or healthy eating. No garlic, no spring onions, no meat. Just vegetables. 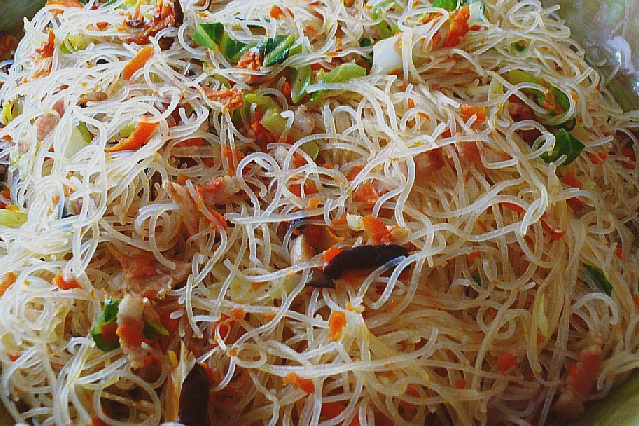 Soften vermicelli in cold water for 15-30 minutes till soft. Drain and set aside. Heat oil in wok over high heat and add shredded mushrooms and carrots and stir-fry until fragrant. Add sliced cabbage, french beans, bean sprouts, soy sauce and vegetable stock. Stir evenly then braise over low heat for 5 minutes. Use tong or a large pair of chopsticks to toss the vermicelli, so as not to risk breaking it up and making it mush. wow the bee hoon looks delicious. i just dun get it, why vegetarians omitted garlic in their food..?